PLEASE DO NOT DECLAW YOUR CAT. This kitty was declawed 10 years ago. Had not been to a vet in many years. Kitty was brought in for a “check up” by its new owner. Kitty would not let me touch her feet and several had swelling, and were abscessed. Did you hear me say she was declawed 10 YEARS AGO. This kitty has been in so much pain. The surgery to remove the fragments took over 2 hours. Still thinking about declawing your cat? I hope not. This is a horrific story about 3 kitties named Teeger, Abby, and Ryder, whose lives have been tragically ruined because of being declawed. These kind of things are happening every single day in North America with kitties and declawing to this degree and various other degrees, but we don’t hear about their stories because the kitties are euthanized. I’ve been working on this very tragic story for the last 3 months and it has rocked me to the core of my being from the agonizing suffering that these kitties are going through and the compassion and care that the owners have for them. The names of the people, veterinary practice, and veterinarians will be kept private. You will feel a lot of anger because of what has happened in the hands of “doctors” who should know better. But mostly, as I have, you will feel great sadness to know that these little kitties never deserved this unimaginable fate. Too many kitties are suffering in so many ways from this inhumane and unnecessary procedure. Please share it with your family and friends. We must get more awareness outside of all of you who are already on board with this cause, to help educate and end this inhumane thing. Here is the story from the words of the cat owners…. Ryder is a very beautiful white/gray male cat which we bought on Craigslist for 40 dollars as a gift for my wife. His birthday was 6/28/2012. We would get him all his check ups and shots, and he would remain an indoor cat. He is a little over 3 years old now. We got him when he was about 4 weeks old. He loves climbing to the highest possible places such as the refrigerator and our dressers. He loves attention and head rubs. He is the most feisty of our cats and takes a bit for him to warm up to you. Once he does, people usually like him the most. We found Abby in the middle of our apartment complex parking lot. She was in the middle of the road not letting me drive past her. I picked her up, and we cared for her ever since. She’s a beautiful black female cat who’s received her check ups and shots and would remain an indoor cat. She’s almost 3 years old and we found her when she was about 4 weeks old. She loves belly rubs and is the ultimate cuddler. She is very vocal and sings love songs to us all the time. She doesn’t like being touched on her head. She loves jumping onto our laps and licking us!!! Her very coarse tongue is endearing. She is known to play fetch with her favorite pink cotton ball! We found Teeger in the same apartment complex as Abby! He’s a beautiful buff/orange colored male cat. He was hiding by our porch playing with some cat toys that I’d left outside to dry! He was about 4 weeks old when we found him and is now slightly over 2 years old. He had a bloody lip/mouth when we first found him. Seemed like he had gotten into a fight. Till this day, he doesn’t have the small bottom teeth and his cute little tongue often comes out. He’s received his checkups and shots and would remain an indoor cat. He likes laying down on our front and back while we sleep and loves begging for wet food. Whenever we’re in the kitchen, he thinks we are preparing food for him and starts meowing. Abby and Teeger are best friends. When we took Teeger in, Abby mommied Teeger and made sure he felt welcome, groomed, etc. She cuddled him and cared for him. Ryder is the eldest and does his own thing, though he will cuddle the other two time to time. We called _____ Veterinary Hospital on 5/7/15 several days before scheduling to get the cats declawed. The receptionist had arranged everything and was well familiar with our case. We had 3 cats to get declawed and she spoke with Dr ______ (owner of this AAHA practice) to negotiate prices. They gave us a discount for having 3 cats and advised to get all cats done on the same day because the doctor that they use for declawing, Dr ____ _____ (30 yr AVMA member and AAFP member) , only came in on Tuesdays). We called back on 5/9 and said we weren’t comfortable with the procedure and the price was still high for us. They gave us another price discount if paid in cash of $1312. We agreed to the procedure and they stressed to give them enough notice if we were to cancel because they would have to block out most of Tuesday to accommodate our cats and didn’t want to lose out on customers if we cancelled late. We called back the same day on 5/9 and said we still weren’t comfortable with the procedure and had bought an off brand of “soft claws” to try first from the pet store. We cancelled the appointment with the receptionist. The next day Dr ___ ____ (the owner) spoke with me and said there was nothing wrong with the procedure. It was straight forward, nothing to worry about, and convinced us to come in on the morning of May 12, 2015 for the procedure. He said Dr ___ _____(the AVMA doc) had done this for 30 years and never had a problem. I mentioned to my wife that Dr ____ _____(the owner) doesn’t really talk much or try and explain things. I remember wishing he would just explain things in more detail to make me feel comfortable. The most he did was reassure us that it was a straight forward procedure and that the cats would be fine. My wife and I brought the cats in and met with Dr ____ (the AVMA doctor) for the first time. He was very old school and professional. Well spoken. He explained the procedure and where the amputation would happen and assured us everything would be okay. He mentioned that he was old school and that he used sutures instead of glue and that they don’t use laser. That he’s been doing this for 30+ years and had never had a problem. We asked about behavior change and he said there was none. We asked because we heard that some cats hiss or no longer use the litter after the procedure. He made it seem as if it was the easiest straight forward procedure and we were relieved. He did a quick check on each of our cats before we left and all of them were easy to handle except for our cat Ryder who threw a fit. Each of them were put on a scale and the regular pre work up was done, temp etc. Dr. ____ had to use a rope lasso on ryder which made things worse. Ryder was freaking out on the floor with the lasso around his body. I had wanted to take the lasso off Ryder but Dr. _____ didn’t want me close for fear of the cat attacking me. I did not feel that to be the case. Our cats always calm down with us around. The declawing procedure was done and we visited our cats. The cats were to stay at the hospital until they were given the okay to go home. Typically they want to keep them 2-3 days which is actually more than the other hospitals that we called to get info from. The cats did not seem like themselves. They were in small “dirty” looking cages and were on hard crate like bottoms, some with a towel to lay down on, some without a towel or anything to lay down on. All their front paws were bandaged up and we were told they were on antibiotics and pain meds. Their bandages were applied by Dr. _____ (the AVMA doctor) personally according to him. 2 or so days after the procedure, the bandages came off. We were given the report that they were “good” but not quite right by Dr. ____ (AVMA doctor). There was some swelling of the paws especially Ryders paws. Teeger was knuckling over where his paws would fold the opposite way kind of like curling your toes. 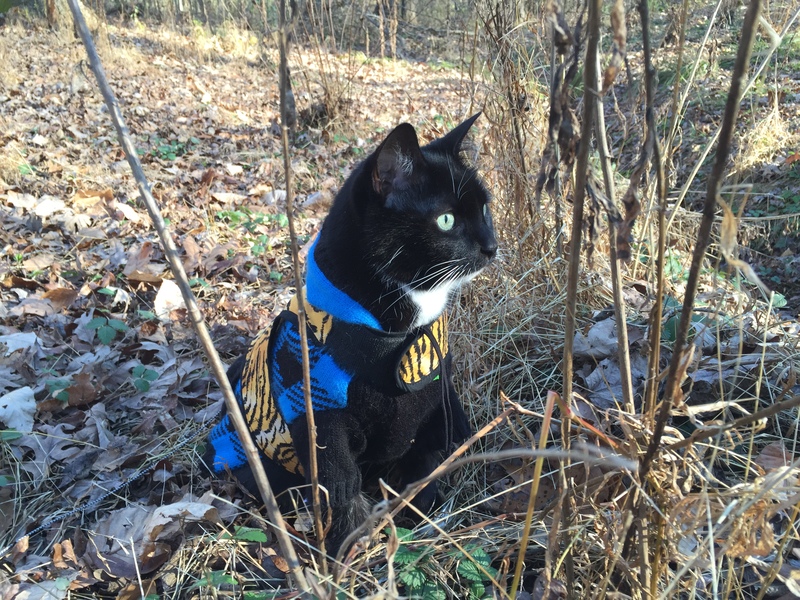 Teeger would not walk properly as if he could not feel his paws. He’d just knuckle over. Abby did not move one bit. She stayed in a corner of the cage essentially the entire time and had no personality. We were told that Abby had stepped in her water bowl and her bandage needed to be changed. We are unsure if her bandage was changed on the day it got wet or the next day. After the 3 days, we tried to arrange a day and time to pick up the cats but we weren’t able to pick them up due to work. At the same time however, the cats weren’t ready and they wanted to keep them several days more. That’s when we knew something was wrong. We were told that we would have to pay for each day extra that the cats would be kept over. We respectfully disagreed and they ended up not charging us for the extra days of housing. We were called and asked if they could give a very good broad spectrum injection antibiotic to the cats because they were worried about the swelling, bleeding, and infection. It was “expensive.” I asked if each of them needed it as they wanted to give it to all 3. They said Ryder should get it for sure because his swelling was the worst. I authorized it for Ryder. I was hesitant that they were just trying to make extra money because some Yelp reviews said that this practice does this type of behavior and you end up leaving with an even larger bill. Later we would find out that they gave the good dose of antibiotics to all 3 cats. I felt they were out for our money because perhaps they had already given the “expensive” medicine to the cats and now they wanted me to pay for all 3. On each of the occasions where we called, Dr. ___ (the owner) would tell us that the cats were doing fine; however, on the rare chance we got a hold of Dr. ___ (the AVMA doctor), he would mention that there’s some swelling and that they needed to be kept for more time. Just conflicting information. In general Dr. —- (the AVMA doctor) was concerned with Ryder and said Abby was doing the best. Each time we visited or spoke on the phone with the receptionist, she would say how sorry she was because she said she had reassured us several times that everything would be fine and that we had cancelled and they had changed our minds and now this happened. On May 20, we were told that perhaps the cats would do better at home. They had not gotten better. They still had bloody and swollen paws. Abby had developed blood in her urine that morning at the hospital. Teeger was still knuckling over. We picked them up on the 20th and kept them in a small bathroom as advised so they wouldn’t move around too much. It was a bloody disaster. The bathroom looked like a murder scene. The cats personalities were completely different. They were antagonistic and hissed at each other. Abby who never hissed began hissing. She still stayed on the floor in the corner of the bathroom bleeding from her paws with glazed eyes and not a thought in the world. Ryder did not want to be in the bathroom and kept trying to put his paws under the door. Their paws were swollen and bleeding and Teeger kept knuckling over. Their pads started turning black and their sutures were coming undone to the point where we could see inside their paws at the open flesh and bone. Abby’s bone was sticking out of her suture area. We took pictures and sent them to Dr. ____(the AVMA doctor) cell phone that night. He texted us back right away and advised us to come over the next day on May 21 so he could see them again. His text message stated that he was unable to clearly see with the pictures enough to make any determinations. We were so distraught that we called _____, an emergency hospital close to our house for advice and if we needed to bring them in. Their price was steep so we decided to just wait till the morning for our meeting with Dr. ____ (AVMA doctor). I had to use a sick day from work to bring the cats in. Both doctors met me that day. My wife couldn’t come and was an emotional mess just waiting to hear updates from me while at work. Dr.____ (AVMA doctor) said there was nothing else they could do for the cats at their practice and that he was seriously worried. He said he didn’t know what was wrong with them and that they need a specialist immediately and that he’s taking full responsiblity whether that was his pocket or his insurance. He gave us the contact info to a doctor from ____ Hospital who was already familiar with our case and was a surgical specialist. I met with this new doctor and he needed time to assess the cats and would be able to give us a better idea of a plan of attack. This specialty hospital was very professional, accommodating, friendly, and clean. We would follow up with ____ ______ the AAHA practice on 5/26 and 5/27 just to make sure that someone was covering the costs of the cats treatment at the specialty hospital. We were told Dr. ____ (AVMA doctor) had made a claim the very day we left on 5/21. Dr ____ (AVMA doctor) was insured by Firemans Fund Insurance. I spoke with our rep from Firemans on the phone and by email the next day 5/28. I explained to her everything thats happened and that Dr. _____ (AVMA doctor) said that either him or his insurance would take care the bills. She wanted information on the specialty hospital and for me to authorize release of the cats medical records from there. She was very professional. On 5/28, I brought the idea of a refund up to Dr. ____ (owner of the AAHA practice) and he said he needed time to think about it and he needed to discuss it with management. He made it seem like it was Dr. ____ (AVMA doctor) mistake and that he shouldn’t have to refund “his money.” He had said maybe him and Dr ____ (AVMA doctor) would split the refund. He stated that he would want us to sign a waiver to free his practice of liability if they were to give us a refund. I gave him a couple days and called back on 6/3. He still needed more time and I was upset at this point. I made it clear that it wasn’t really even a consideration and that a refund should be a given and that we would not sign any waiver. I’d give him more time again. I followed up with him on 6/9 and he finally agreed to have me come pick up the check the next day. I would call on 6/10 to arrange a time to come pick up the check. Dr._____ (owner of the AAHA practice) had stated that he wanted to give me the check personally, but the receptionist gave me the check instead. Total refund of $1312 on 6/10/15 by check. Note: for the several times I spoke with Dr. _____(owner) since we started treatment at the new hospital, Dr. ____(owner) always spent the first part of our conversation asking how the cats are doing and how disappointed he was in Dr. ____ (AVMA doctor) for messing up and that it lost him our business. On June 12, I had contacted our Fireman’s Fund rep by email to let her know of our devastation with everything and to inquire on the possibility of suing. In addition, I was worried about the escalating costs of everything and wanted to know where we stood in case it went over the 100K. She never got back to me. After not hearing from our rep for weeks and stressing over the cats treatment and costs, I called her directly on July 1st and spoke with her for 26 minutes. She was very nice and professional the first time I talked with her when this first happened. This time was different. She was rude and unprofessional. She was complaining of the escalating costs and guilting me for choosing treatment for the cats. She asked if I would have spent this much of my own money on the cats. She said we should get new cats because the cost is outrageous. I tried explaining to her that my cats are family and that you do whatever it takes for family. The costs at that time were around 60K if i remember correctly. In addition, we were told by the new hospital that Firemens insurance did not want to cover the costs of having the cats stay overnight anymore because most of the major surgery and emergency treatment had been done and they just needed bandage changes every couple days. We felt cheated by this system because we didn’t have the time to bring the cats in every couple days for bandage changes and often times their bandages would fall off earlier and we were required to bring in the cats right away. This happened often daily and several times a day. We were overwhelmed and preferred the cats to stay at the new place until they were “better.” I brought up to our Firemans Fund rep that we wished they would cover the costs to keep the cats longer and I convinced her that if we had to continue to bring the cats in everyday and often several times a day, it is unreasonable to keep the cats at our place. The Specialty hospital and Firemens and us agreed on a day to have the cats come back with us as Firemens still didn’t want to pay for costs while waiting for the cats to get better. I called the specialty hospital manager and left a voicemail the same day to let her know we were concerned with the escalating costs and briefly let her know what the Firemans Fund rep said to me and that she was rude, upset over costs, guilting us and said that we should have gotten new cats because it would have been cheaper. The specialty hospital manager and I ended up speaking finally over the phone and she informed me that she was absolutely appalled over what the Firemans Fund rep had said to me and that she had escalated the situation and had spoken not only to that rep but her supervisor. The Firemans Fund rep had been spoken to by her supervisor over her inappropriate and unprofessional interaction with me. The specialty hospital was very professional and made us feel a lot better about everything and that our cats would be taken care of. Since bringing the cats to the specialty hospital, Dr _____ was the head surgeon on the case. After evaluating all of them, Dr. _____ was very concerned and had made it clear that no other case like ours has ever been recorded and that treatment that was needed for the cats had never been done to cats needing treatment on all front paws at the same time. The plan was to do hydro therapy daily with “wet to dry” bandages to promote healing and circulation to the paws. The bandages would “take away” dead tissue and body waste/puss etc to promote healing. The cats were sedated daily for this procedure along with pain meds and antibiotics through IVs. Treatment would go on so long that new IV access points were needed as the old IV veins were no longer viable. Dr _____ and other surgeons would give us daily updates and we would visit almost daily! They were concerned with infection in the bone for Ryder and it was a waiting game for all three cats because they didn’t know how to treat them. What had happened was Dr ____ said the culprit was the bandages that were put on too tight by Dr. —(AVMA doctor). This caused bad circulation and tissue death. The surgeons wanted the cats paws to “declare itself,” meaning wait to see how the skin and circulation ends up permanently. There would be no reason to treat the cats if the condition was still deteriorating. They wanted to see the extent of the tissue death first. Often times they would check the sensitivity and hardness of the paw pads and were concerned with all of them. After waiting weeks, there was a clear line on the cats arms where the end of the original bandage ended. The skin literally died up all their arms till that point. This was proof that the wrap job and the skin death ended at exactly the same point. Dr _____ handed us off to Dr. _____ at the specialty hospital who dealt more with traumas in particular. Her mentor was an avid trauma professor who is taking an interest in our case and had requested all the photos from each checkup of the cats. The professor is making a trauma book with these photos. Dr _____ would end up doing surgery to remove all the dead tissue that hadn’t fallen off yet. The tissue death was different with all three cats. Abby’s skin died so far back that both paws had to be removed. Ryder’s left paw had the skin literally fall off to the point where they thought his arm would have to be amputated. He would have to have further amputation on his left paw to remove bone past the initial declaw. Teeger would need amputations on both paws taking away more bone past the initial declaw as well. Since the surgeries on all the cats, we’ve taken them home to recover. The bandages needed to be changed twice a week and then eventually weekly and if they fall off, we had to bring them in right away. Often times, we’d be bringing in at least one cat a day because bandages kept falling off. One day, Abby’s bandage came off 9 times at the hospital. Our work schedule and life have been thrown upside down. We’ve woken up in the middle of the night and noticed a bandage was off and had to bring the cat to the vet. We’ve found out a bandage fell off right before work and were late to work because we had to take them to the vet. It’s been half a year and we’re still dealing with this. The cats are no longer bathroom trained and pee and poo where they please. We walk in to pee on the carpet, our couch, and our bed sheets. We barely have the time to monitor them and keep up with the demands of cleaning the house and taking them to the hospital. Initially all the cats had bandages on all their front paws. Teeger still has both bandages off. He cries all the time and walks on 3 legs on the hard wood and 4 legs on the carpet. He’s developed what looks like a scab on a paw probably because of a lack of paw padding. Ryder’s one paw is healed. His left paw is still bandaged and he’s had a cone on everyday for about 6 months now. His wound wasn’t getting better for about a month and progress had stopped. The doctor debrided his wound and took off some tissue hoping to restart the healing process. It has worked and his wound is getting smaller. Ryder has only used 3 legs for months now and we are worried that the non use will cause problems in the future and the docs have mentioned possible arm amputation. Abby has both bandages off now and only likes to walk on the carpet. She struggles on the hardwood. Since she walks on nubs since she’s both fully paw amputated, we have to evaluate how she does walking and if she develops sores, etc. It is quite possible that they need to do surgery to add padding from her rear pads onto her front nubs. I reached out to all the following parties involved through emails and phone calls. 2) The 30 yr AVMA member vet who I was told is semi-retired and was on a long vacation in Europe. No response. 3) The vet and owner of the AAHA practice. He said he doesn’t do declawing himself and had this vet coming in to do them. He said that the vet will no longer be working there and that he will not be doing declaws at his hospital anymore. 4) I sent emails with a copy of this story, asking for a comment on what happened, to the senior communications director of the AAHA-Kate Wessels, the President of the AAFP- Dr Susan Little, and Senior Media Relations Specialist- Michael San Fillippo of the AVMA but received no reply. CHRONIC PAIN AFTER DECLAWING: This is the sweet Miss Tooters. She is around 2 years old and is from Southern Indiana. She was found as a stray outside already declawed on all 4 feet. Her new guardians are determined to provide her a home for the rest of her life but would like to figure out how to get her to use her litter box more consistently. She prefers soft surfaces like blankets and clothing. They made the over two hour drive to see Dr. Nicole Martell-Moran at the Cat Care Clinic in Indianapolis for a free paw evaluation with Xrays. Only one small bone fragment was found (most likely not the primary problem) however, her front left foot was very contracted similar to hammer toe (see pic below). This can be very painful, especially when trying to dig in litter. She was also quite obviously against us touching or even coming close fo touching her toes during the exam. She was put on pain medication for some relief. The hope is that given her young age maybe the hammer toe can be relaxed a bit and she can lead a life of less pain that declawing has given. If her pain cannot be managed the fragment can be removed and affected hammer toes stretched or tendons surgically cut for relief. Hi, my name is Teeger. 6 months ago I was declawed at an AAHA, standard of excellence, veterinary hospital, which means only 15% of vet clinics get this top rated accreditation. My sister, brother, and I, all had our toe bones and claws amputated by the old school method, by a 30 yr member AVMA vet who was also an AAFP and California Veterinary Medical Association member. In fact, our owners were talked OUT of using soft paws by the owner of the AAHA hospital and the AVMA vet who declawed us. They said declawing is a standard procedure and that we would be ok.
Because of complications from these declaws, we all have had either all or most of our paws amputated and are living a nightmare of pain and suffering. Here is a comment from a veterinarian on a vet website about the topic of declawing and he was commenting about the “crushing” method that he uses. This vets specialty is orthopedic surgery, he was a past President of a major veterinary association, and was even named vet of the year. Please reach out to YOUR veterinarian and ask them to honor the oath they took to heal and help animals and STOP declawing. I have a growing list on my website, CityTheKitty.com, of many humane vets and practices who don’t do this mutilating surgery anymore. If your vet won’t stop declawing, you have the option of taking your business to one of these doctors who completely honors the oath they took. The more you all do this, the sooner we will end declawing. Read Teegers full story here…. A declawed dog that had to be euthanized.